Before I tell you about my trip this past week, I’ll tell you about this picture. 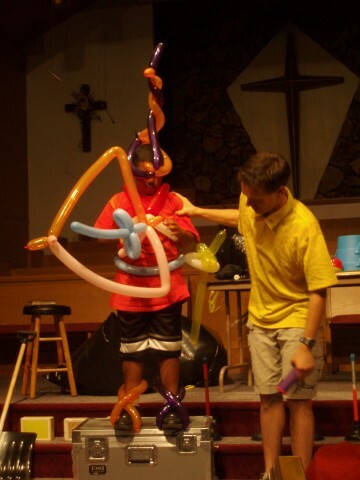 This is my first attempt (after a practice run) at the armor of God with balloon animals! The kid is holding the shield of faith sideways, but I must admit that the shield came together much better than I intended. It was fun. I had the kids repeat back to me all the parts of the armor several times while I was fixing up this guy. It was great watching him go back to his seat. His friends had to “de-suit” him just so he could get back into his pew seat. So I just got back from a week-long juggling trip in Peoria, IL. I got word that back in the Vaudeville days, performers of all types would test their act in the great American town of Peoria, Illinois first. If they flopped there, then they would probably never make it on the big stage. But if Peoria liked the show, then that was a sign that they could take their show on the road. I guess I can say that things went pretty well. I did eight programs in four days. I was exhausted at the end, but I loved every minute of it. There is nothing I would rather do than share the Gospel of Jesus while I juggle. My friend Brad Habegger carted me around and saw most of my presentations. He was able to give me some great feedback on what worked and what did not work. That is valuable information. Not everybody is willing to tell you about the parts of your program that should be edited in order to improve the overall effectiveness. He is a great brother in the Lord and has a heart for ministry to children as the Director of Camp of Champions USA in Peoria. I also got to present my juggling to Camp Good News (CEF) and Faith Bible Camp. These were overnight camps – the latter one having their “middle schoolers” week. And boy was that a hoot. I intentionally picked out one the outspoken male eighth-graders and made him be my guinea pig for my routine with the hammer of death, the Arabian saw blade, and the American grillmaster pitchfork. He didn’t flinch much, but it was fun messing with him. While on this trip, I read a great article by storyteller Stephen James. He said that the success and effectiveness of ministry should not be how much the audience laughed or how many people showed up for the event. If that were the case, then people like Jeremiah and Jesus would be considered ministerial failures! Rather, let us measure our effectiveness based on the mantra of John the Baptist: “He must increase and I must decrease.” Was God glorified? Were people given the space and opportunity to worship God? Was the Word of God proclaimed? These are the questions I want to learn to ask myself after a juggling program. This comment is a little late in coming.. but you did a great job at Camp of Champions! We enjoyed having you!